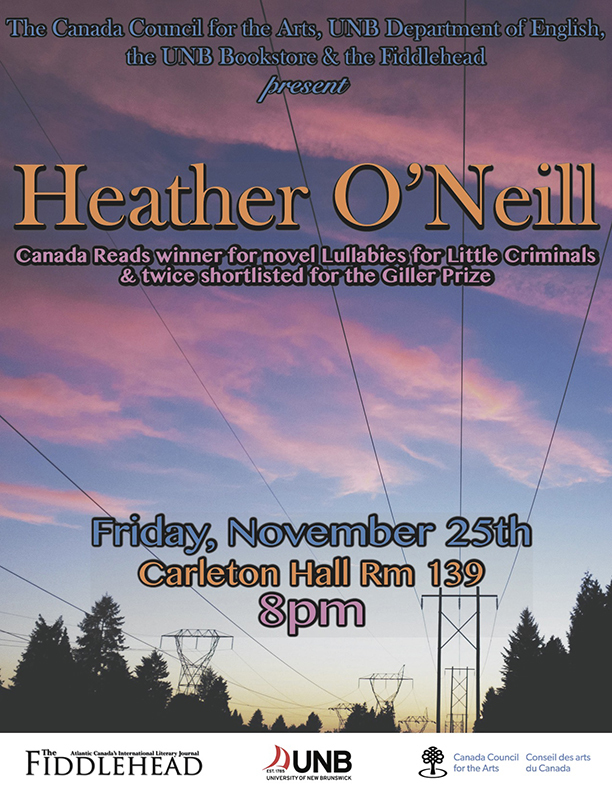 Heather O’Neill will be reading from her work this Friday, November 25th at 8pm in Carleton Hall room 139 on the UNB campus. The event is free to the public and all are welcome to attend. Not only is Heather O’Neill a bestselling novelist, she is also a poet, shortstory writer, screenwriter, and essayist. for the Giller, and O’Neill’s debut novel Lullabies for Little Criminals (2006) won Canada Reads and was shortlisted for the Governor General’s Award for Fiction. O’Neill has a new novel, The Lonely Hearts Hotel, to be released in 2017. Set in Montreal and New York, the story follows two orphans who use their incredible talents to survive servitude, poverty, and the Great Depression. For Rose and Pierrot, true love, music, and dance are reason enough to live, even in the direst of circumstances. Born and raised in Montreal, O’Neill lives there currently with her daughter Arizona.